For more information or to reserve your date, please contact our Birthday Party Coordinator. Additional pizzas, more than 16 children, upgrades to ice cream cake, party decorations, extended room or activity time and adult supplies are available at and additional charge. Please contact our Party Coordinator for more information at time of reservation. Outside food for parties is allowed, however we do not have the means to cook or reheat and sternos are not permitted in the facility. In order to ensure the safety of our swimmers, it may be necessary to close the pools during inclement weather. In the event of a closure, lifeguards will make the announcement to clear the pools, at which time, swimmers should exit promptly. When the storm passes, or thirty (30) minutes after the last thunder heard and/or lightning sighted, lifeguards will announce when it is safe to re-enter the water. Please note, this policy has been created in alignment with the policies created by the YMCA, the NCAA, and the National Athletic Trainers Association. This is our most popular party option. A splash party is a great way to have fun in our pool and includes hour and fifteen minutes to swim, fifteen minutes of changing time and one hour in the party room. Pool time is monitored at all times by certified lifeguards. We provide balls for basketball, pool noodles, and lifejackets for those who need asisstance. All swimmers must complete an Aquatics Waiver. In cooperation with our gym supervisors, our birthday party hosts will prepare an energetic and exciting program that will make your child's birthday party a wonderful experience. Your child can choose which type of sport or strategic game he/she would like to play during his/her own party, a rare option for parties away from home. The Sports party includes an hour and a half of planned activites and one hour in the party room. We provide all the equipment and all you have to do is make sure all participants are wearing sneakers. 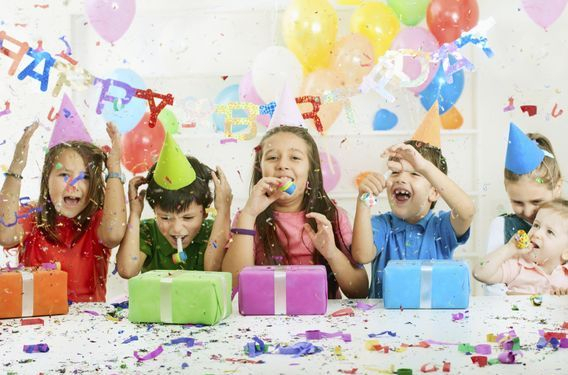 Our party hosts will create a fun filled, imaginative, and creative experience for your child on his/her birthday. We offer a number of different creative craft options your child can choose from, or you can work with our Party Coordinator to create your own. The Arts & Crafts party includes an hour and a half of craft time in the Red Community and one hour in the party room. These parties must be booked at least three (3) weeks ahead in order to ensure arrival of craft supplies.